Online PR can dramatically raise your business profile, often with simple tasks you can perform yourself. And there are some great public relations tools to help you do that. ThePRDoc® constantly looks for such products, including books, educational courses, specialized PR software and other public relations tools. The products we recommend come from people we have carefully vetted. Each is a top marketing and public relations professional. We receive compensation when you click on links on this page and make purchases from the merchants selling recommended products. This arrangement is a winner for everyone – you get great products, the people who developed them get paid for their work and so do we for making the connection. 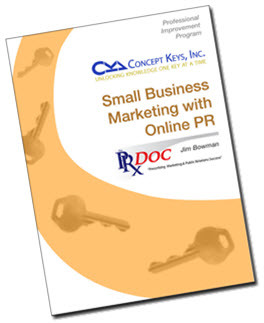 Small Business Marketing with Online PR draws on more than 30 years of marketing and public relations experience of Jim Bowman (ThePRDoc) in companies of all sizes. It helps you make sense of the bewildering array of options for marketing your business online, whether you do it yourself or hire expert help. We use a company called Concept Keys, where you enroll online and begin receiving a 15-part series of daily lessons. Each lesson is designed to be completed in 10 minutes or less and deals with a key concept for understanding what online public relations is and how to use it. Get the full story here. This is a course we wish we had written ourselves, but since Marc Harty did such a good job on it, there is no need for another one. Online PR Made Easy will help you learn how to write and distribute professional-grade online press releases. The course includes 20 video tutorials, templates to help you format releases properly and a list of more than 175 online press release distribution sites. Also by Marc Harty, this is a great and very low-cost way to start publishing online press releases in minutes, not days and weeks. Marc includes seven templates for different types of publicity. He also includes samples of proven headlines (the most important part of any press release) you can borrow from and customize for your own use. PR Traffic Press Release Templates also includes descriptions of 23 different personas to help you tell your story from a number of points of view, from Underdog to Market Leader, and more bonuses. This is one of the simplest and most effective public relations tools a small business owner – or PR professional – can own.